More Cream on the way? Are there fresh Cream gigs on the way? The three members of Cream plan to meet again in October, with more live dates likely being discussed. Bassist Jack Bruce says that he and Eric Clapton plan to attend a 3 October ceremony at which Ginger Baker will be given a Drummers Achievement Award by cymbal maker Zildjian at the Royal Festival Hall in London. "'Cause I'm only the bass player, I can't say for sure," Bruce says. "I know there's a good chance we may play at that event... but I don't want to overstate it and make it into something it isn't." Nevertheless, Bruce said that he, Clapton and Baker will likely "have a chat about" some future reunions. 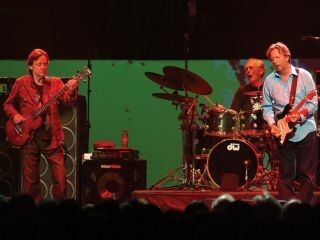 The trio regrouped in May 2005 in London - resulting in a live album and DVD - and October 2005 in New York. According to Bruce: "I think there might be a chance of some more. I would like to do some more, 'cause I enjoyed it. It was very emotional. I would like another shot at it. "It's quite difficult for us, 'cause it's all very separate. Ginger's living in South Africa. Eric's this mega-star, and it's difficult for us to keep in communication. But as soon as we do it's wonderful." In addition to Baker, Zildjian will be honouring the Jimi Hendrix Experience's Mitch Mitchell at the October ceremony. Other drummers expected to attend and perform include Led Zeppelin's Jason Bonham, The Killers' Ronnie Vannucci and Razorlight's Andy Burrows.